Good news for the students who wish to appear in both JIPMR and PGIMER entrance exams for July 2018 session. 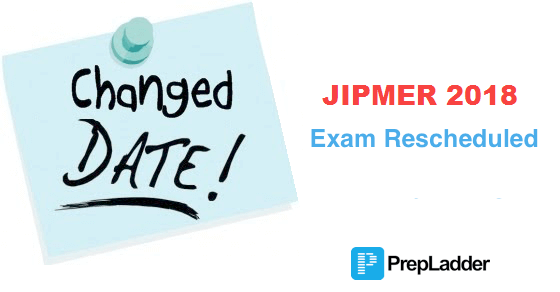 The exam dates for JIPMER entrance exam has been changed. According to the recent notification, the date and timing of entrance exam for admission to MD/MS/DM/M.Ch/PDF courses July 2018 session have been rescheduled. To buy "Target Jipmer November 2017 Supplement by Dr. Arun Babu" at the best price, click here. Another important part of the notification says that the students who chose the entrance exam city ‘Chandigarh’ as the first option alone in both MD/MS & DM/M.Ch/PDF courses would be allotted to the other city based on their second and third option. All other dates and conditions mentioned in the prospectus remain unchanged. You can also go through the official notification here.